Fan video for "Modern Woman" featuring clips from the short documentary "Building The Bridge." ​Video by Tony Walker. ﻿ "Modern Woman" was a top ten hit, but is not one of Billy's best. It sounds dated today with its intermittent synthesizers and pseudo-funk beat, and even back in 1986, it sounded awkward. It was the main song to the movie Ruthless People starring Bette Midler and Danny Devitto, which was a mediocre and forgettable movie. But for whatever reason, this song actually reached #10 on the Billboard charts. Billy has said he does not really care for the song, and it is not found on any later compilations or live albums except for My Lives in 2005. Good move. How can both "Modern Woman" and "Air: Dublinesque" come from the same musical mind? Still, there is something catchy about it. 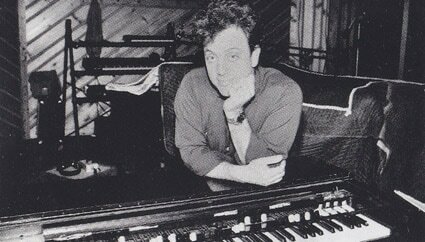 Billy Joel in the studio. Credit: Larry Bucasa. Columbia publicity photo (1986). Billy and Bette Midler were in another movie together too, Disney's animated Oliver in 1988. Billy was the voice of Dodger, the streetwise mutt, and Bette was the voice of Georgette, the vain poodle. Years earlier, in 1977, Bette Midler recorded a cover version of Billy's "Say Goodbye to Hollywood." It was on Midler's album Broken Blossom. Back then, Midler was more well known for her singing than acting. You can listen to it here. Billy briefly discusses "Modern Woman" on SiriusXM. Billy discusses "Modern Woman," from the 1986 documentary "Building The Bridge." Fan video for "Modern Woman" with still photos from the movie.